The X-Rocker Titan Gaming Chair is a £219 investment looking to improve your total gaming experience. It offers innovative sound design, wireless connection to your gaming system, and optional vibrations to enhance your gaming experience. The Titan gaming chair stacks up well against competitors but there some areas in which it falls short which we will look at in this review. The X-Rocker Titan Gaming Chair sets itself apart from other chairs because of its unique forward-facing speakers. These are positioned on either side of the user’s head and offer incredible sounds and great bass, regardless of whether you are using it to enhance your gaming experience or to sit back and enjoy movie or some music. This is due to its amazing 4.1 surround sound that can enhance any entertainment experience. 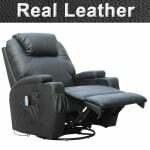 The X-Rocker Titan chair also sets itself apart with the high level of comfort it offers to gamers. 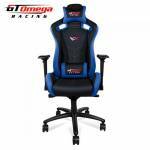 It is designed with the perfect seat depth for both adolescent and adult users, meaning that it will remain comfortable whether you are sitting down to enjoy a few short hours of gaming or are planning on pulling an all-nighter to play with your friends. It is also designed with back support and proper cushioning, to improve its level of comfort. Additionally, the X-Rocker Titan is covered in a breathable fabric so you don’t sweat or stick to the chair after long hours of sitting. 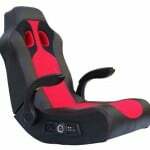 Finally, this gaming chair rocks, allowing you to position it however you need to for your entertainment needs. 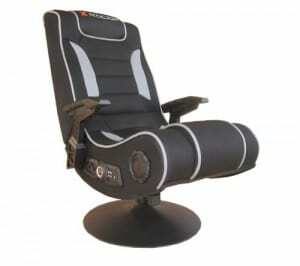 The X-Rocker Titan Gaming Chair also offers optional vibrations and wireless connectivity. Its optional vibrations range from a slight buzz to intense vibrations that will fit your gaming mood. Its wireless connectivity is also great, allowing it to connect to a number of systems without the hassle of wires running across the room. Unfortunately, some have difficulty getting it to connect to newer systems like the PS4 and Xbox One. This may be because it is connected using an A/V setup and is not compatible with an HDMI setup. 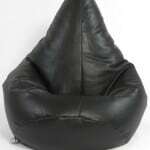 There are several obvious pros of choosing this chair to enhance your gaming experience. It offers top of the line sound and optional vibrations that improve any of your entertainment needs. 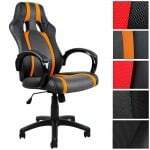 The X-Rocker Titan Gaming Chair also is very comfortable, being constructed of comfortable padding and breathable fabric in a design that provides great back support. Finally, it is foldable for easy transport and can be connected to 7 other chairs for a multi-player experience. The biggest drawback of choosing the X-Rocker Titan Gaming Chair is its connectivity. While it is compatible with a wide range of systems, some have reported difficulty connecting to newer systems. It also is not compatible with HDMI modes, and works instead through A/V connections.